It’s no secret how much I love color and art. When I’m surrounded by bright, happy shades and beautiful artwork, I just feel happier — and more inspired. So, I thought it would be fun to share a few of the ways I embrace color + art in my home — and my life. I created this Be Still and Know collage last winter. It serves as a beautiful reminder each day. I love a good art cluster on the wall. I like to combine my own artwork with precious photos and inspiring artwork by others. Each piece I add to my curated collection tells a story and means something to me — which makes the whole display all the more special. This wall holds art by some of my favorite artists: Heather L. Murphy, Sarah Ahearn Bellemare, Dinara Mirtalipolva, and Michele Maule. I’m a huge fan of comfy, cozy pillows — and of course I can’t resist playful patterns and pretty palettes. I like to add fun details wherever possible — like these cute + quirky handmade clay birds that my elementary art school teacher made. Don’t feel like you have to confine your art and color to just your walls. Consider making your cupboards happy with multi-hued dishes + cups. Ah, I am quite the notebook addict, and is it any surprise that I keep a colorful array of pens and notebooks at-the-ready to record every idea, hope, prayer, and daydream? This adorable set is from Target. I love the sweet quotes, and — of course — the polka dots. What about you? How do you incorporate color and art into your home and life? This is something I’ve been reminding myself lately… Words I need to carry in my heart. I’ve been asking myself why I’m blogging, where I fit in the blogging world, and what kind of an impact my little blog is making. They’re hard questions, and I don’t always have answers. But I do know that He made me to create. That it’s such a part of who I am, and it brings my heart so much joy. I’ve also realized I haven’t done much in the way of art making lately, and it’s something I am definitely missing. I’ve been working on mapping out eBook ideas and blog posts, and somewhere along the way, I stopped art journaling and making new collages. I know that’s something that needs to change, because the creative process of putting paint and image to paper or wood or canvas refreshes me in a way other creative pursuits cannot. So, this is what I’m learning: Even when I feel a bit lost or insignificant, or even when I feel just too busy, I have to push through. I have to keep writing and blogging and painting and collaging. I have to do less comparing and more creating. And I have to let Him handle the rest. 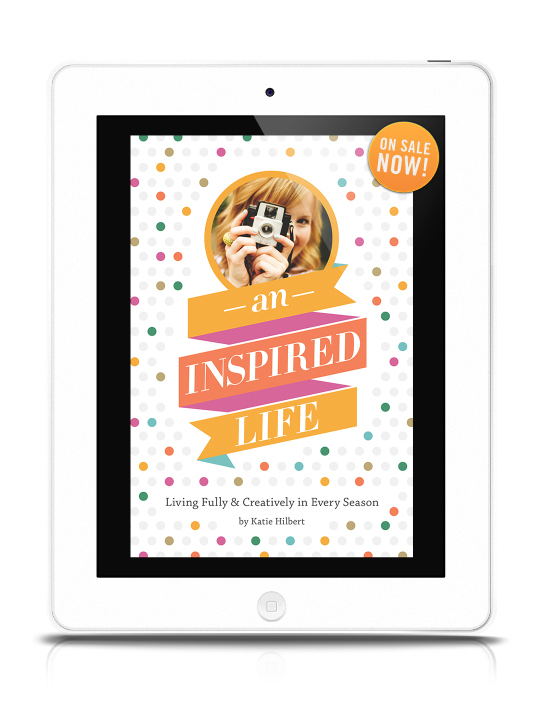 Is there a creative pursuit you love that you aren’t pursuing? Something that’s been neglected due to busyness or insecurity or doubt? This week, I want to encourage you to jump back in — do more creating — the kind that brings you the most joy. Lately, I’ve been thinking about the importance of stepping away from the screen. Inspiration is everywhere — and if we don’t allow ourselves the time to get out to explore and discover it, then we’ll miss it. Earlier this week, I went for a brief walk after work, taking advantage of the small window of time I had before a rainstorm broke free from the clouds. I took my camera and left my phone at home, so I could wander in peace. I took in all the colors, the patterns of leaves on the ground, and the way the sky looked. I even found little reminders of my One Little Word. I’m thankful I took the time to step away and be refreshed. I’ve also realized I haven’t been creating as much with my hands lately — layering papers and ephemera in my art journal, or playing with paints to create a colorful collage. These are things I know I need to put back into my creative routine, things that are essential to who I am as an artist and creator. What about you? What kinds of things do you do for creative refreshment? Do you find it’s important to take time away from creating on the computer? I love to set goals, and I love making lists, so it’s no wonder I like to dream up new creative goals often. A list of motivating goals helps keep my creative life feeling fresh and pushes me to keep growing and learning. Because setting goals can be so encouraging and rewarding, I thought I’d share a few of the things I do/think about when making my own lists. I hope after reading this, you’re encouraged to set some new goals of your own! * Make it fun. I love to journal, so I’m constantly using my various journals as a place to keep track of dreams and ideas. This is great, because I can record new ideas constantly and quickly (I always have one of my journals at hand), but sometimes, I like to do things that make the process feel special and inspired. I might enjoy a favorite treat while writing and dreaming (like a latte, mug of cider, or some dark chocolate), or I might get out of the house and go somewhere beautiful (like a park). * Pray. This is something I do all throughout my goal-setting process. I ask for inspiration and direction, as I set goals, and I ask God to bless my creative efforts and use them for His glory, as I pursue those goals. I’m so thankful for the creative heart I’ve been blessed with, and praying through my goals and creative dreams is such a beautiful part of my relationship with the Lord. * Be stretched. Don’t be afraid to set goals that scare you a little bit. Goals should push you to try and learn new things, as well as help you refine the skill set you already have. As a creative, I began as a writer, but over the years, I’ve explored collage making, designing, and photography. I’ve discovered so many new things I love to do, and it’s all because I took risks and set goals to try things I’d never done before. * Celebrate! I love my 20-something lists, because they allow me to track my goal-setting and pursuing. When I write my recaps at the end of the year, I’m able to see how my goals shaped me. I definitely recommend recording and celebrating your creative adventures in some way, whether it’s through journaling, blogging, Instagramming, whatever! You’ll be so encouraged to see your progress, and your journey might even inspire some new goals! So, what are you waiting for? Go ahead — start dreaming + goal-setting! Inspired by Jessa Anderson’s Good Things series, I decided to start a similar series at A Place to Dwell. Following God’s instruction to us in 1 Thessalonians 5:16-18, I want to keep a regular running list of all the good things He blesses me with even (especially!) during the more difficult moments and seasons. Jessa explains her series as such: It’s simply a collection of the things in my life that are worth celebrating (big or small), and I find that writing them out especially helps me to overcome my tendency to complain. Life does come with frustrations, but I find that when I look at the big picture, they are usually small things in comparison to all the blessings God has graciously given. Even during our lowest moments, counting our blessings can remind us of the joy we have been given in Christ Jesus! I love the idea of posting what I’m thankful for as a regular blog series, since it’s something I’ve done on and off in my journaling the last five years. It truly is such a good way to remember the joy we have been given in Christ Jesus. The discovery of a delightful new market to shop at that’s full of delicious and healthy foods; the amazing church I belong to and the way my fellow brothers and sisters in Christ partner with me in prayer, encourage, inspire, and help me to know Christ more fully and completely; the perfect evening weather for a walk outside; my daily quiet time and the hope I’ve been finding in God’s Word; a new font to design with; an upcoming craft show adventure with my sister; hearing Jessa Anderson’s music for the first time today and connecting so completely with her lyrics; the best friends a girl could ask for; and last, but not least, this little blog of mine and all of my faithful readers. Creating new pieces of artwork; participating in my company’s holiday art sale; Thanksgiving with my family; and putting up my little Christmas tree. I’ll be back soon with my Hello, December post.